Originally published in the Asia & the Pacific Policy Society Post here and the South China Morning Post here. The purchase of a second-tier English football club by a Chinese conglomerate provides a window into a business culture of relationships and reciprocity, Simon Chadwick, Paul Widdop and Dan Parnell write. When Chinese conglomerate Fosun International Limited acquired English second-tier football club Wolverhampton Wanderers (commonly referred to as Wolves), many of the club’s fans anticipated a cash windfall and some high profile player signings. Neither happened; indeed, the team’s performances were so unsatisfactory early on in the season that the team’s manager was sacked. Fosun were clearly unhappy, as languishing in the lower reaches of second-tier English football neither cast the company in a positive light nor added significant value to China’s current football revolution. Even so, Fosun is unlikely to see its first foray into European club ownership as a disaster. Football alone was never likely to be the only reason why Fosun bought Wolves. As a conglomerate, this might seem an obvious thing to say, as this type of organisation owns multiple businesses across a number of often-unrelated industrial sectors. At one level, Wolves could be just another investment in a broad portfolio of Fosun properties. However, at another level, acquiring assets in football brings a much broader range of potential benefits. Fosun owns a 20 per cent stake in Gestifute, football super-agent Jorge Mendes’ player representation agency. Together, Gestifute and Wolverhampton have opened up a network to Fosun that is ultimately intended to be of much greater value to the company. This is intended to enable Chinese businesses to create connections, relationships, and networks that help them bypass normal governance systems or conventional business practices. An important aspect of this is the social ties between individuals, which are intended to provide direct or exclusive access to insider information, business contracts or scarce resources. In this context, it seems that Fosun’s acquisition of Wolverhampton Wanderers is a classic case of guanxi. Owning a successful football club in itself is good guanxi; with President Xi and senior members of his government having committed to a Chinese sports revolution, being part of the global football network makes good sense for Fosun. Yet even if Wanderers do little more than play out the coming seasons in mid-table mediocrity, Fosun may not be too concerned. After all, guanxi dictates that there’s more to the Wolves deal than meets the eye. 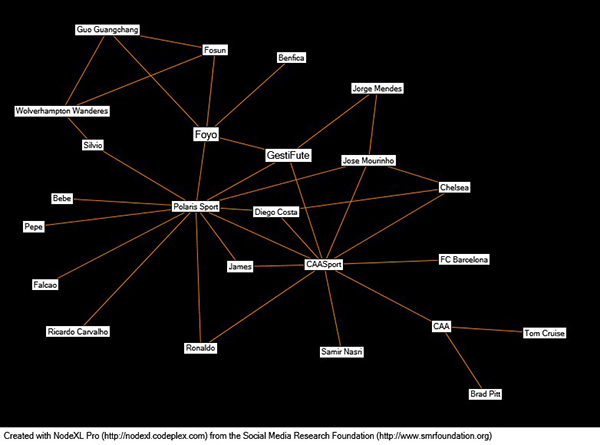 Indeed, having undertaken a social network analysis (which was derived from media sources) of Wolves and its new owner Fosun, it appears that the club is simply a hub in a much more significant collection of relationships and connections. Wolverhampton Wanderers’ owner Fosun is owned by Chinese billionaire Guo Guangchang. Guo is widely acknowledged as being one of China’s richest men, with a net worth of around US$5.9 billion. Guo has built a corporation with interests in everything from mining to pharmaceuticals to real estate. In many ways this is Guo’s guanxi, his network extending way beyond second-tier English football. More significantly, in football terms, Fosun also set-up Foyo Culture and Entertainment Co Ltd. It is this company which in turn owns a minority stake in Mendes’ Gestifute. This provides agency services to football players through a subsidiary company, Polaris Sports. Among Polaris’ clients are Real Madrid players Cristiano Ronaldo and James Rodriguez. Polaris also works with current Manchester United manager Jose Mourinho, who has long-standing links with Jorge Mendes (his agent for many years). Together, Gestifute and Polaris partner with American company CAA Sport (a global sports and entertainment agency), which has numerous clients across football including FC Barcelona and Chelsea. The agency is itself part of a larger company – CAA (Creative Artists Agency), which represents a number of Hollywood ‘A-List’ celebrities. Tom Cruise and Brad Pitt are two of CAA’s clients. Cruise and Pitt may not appear to have too much in common with a post-industrial town in the middle of England, and are unlikely to be turning out on a Saturday afternoon in Wolves’ famed gold kit, yet our map of Wanderers’ guanxi network shows there is a road that stretches from Hollywood to Wolverhampton. This begs the questions: why, and what is the return on investment for Fosun? In recent years, the Chinese conglomerate has diversified into films and television, via its production company Fosun Pictures. The network connections to Cruise/Pitt/CAA therefore make a lot of sense, especially if one looks ahead to a Fosun-produced Hollywood blockbuster at some stage in the future. This still seems a long way, though, from Wolverhampton. However, the town’s location in England’s West Midlands conurbation (home to Birmingham – England’s ‘second city’) may hold some clues. Rumours are currently circulating that British terrestrial television broadcaster Channel 4 is about to relocate from London, with Birmingham thought to be its favoured location. It is also rumoured the move may be part of the development of a much bigger media and entertainment complex in the city. A corporation like Fosun, already investing heavily into the sector, would therefore appear to be ideally placed to bid for contracts that might emerge out of such a development. At the same time, there are major plans for Britain’s HS2 rail link to pass through the West Midlands, which would generate further business opportunities. Fosun recently became the first private Chinese company to own a bigger stake (US$ 6.9 billion) than the government in a high-speed railway project. The company is therefore ideally placed to bid for HS2 work. And this is how guanxi works: when Fosun bought Wolves, the conglomerate was not simply just buying a football club. It was buying into a network of relationships and connections that Guo no doubt knew would have much broader, deeper and financially lucrative implications for the conglomerate. While it seems unlikely that Brad Pitt will become a regular spectator at Wolves’ home games, the fact he forms part of the club’s wider network reveals a great deal about both guanxi and how Chinese business works.